I recently upgraded Firefox to version 4 and out of no where Yahoo becomes the default. No clue why. It always used to be the Google as default search engine. Hang on what is the default search engine in Firefox browser? When you type any search query in the address bar and hit enter you will see Firefox shows search result from Yahoo/Google/Bing depending on the default search engine set in your Firefox browser. I was thinking that there might be a simple setting somewhere which will allow to change the default search engine but to my surprise it is not so simple. I had to do a little bit of search to find out how to change default search engine in Firefox browser. It will prompt for with a message, accept the danger and more on. Here you will see the default search engine value. You can set the search engine which you want to use. Google, Yahoo, Bing or you can enter any other search engine. Enter any search query in the address bar and see which default search engine it pickup. It didn’t work for me. In fact the default search engine set in my Firefox browser was Google. However whenever I entered search query in the address bar it picks up any random search engine from Google/Yahoo/Bing. This is weired. I thought this would fix the default search engine but it didn’t. May be this setting doesn’t work in Firefox 4? 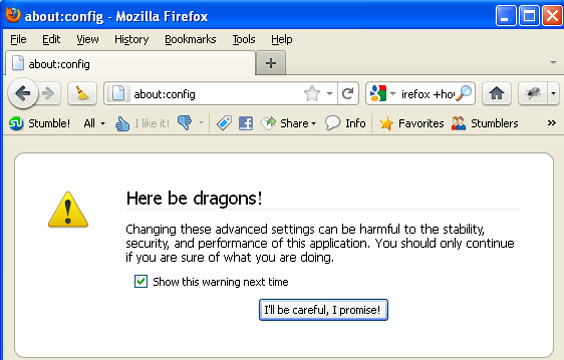 Or it is some other setting which is overriding the Firefox browser setting? My next guess was that may be some Add-ons or plugins are causing Firefox to switch the search engine randomly. So to check what is going on I typed a query string and while hitting fixed my eyes on status bar to see what it shows. When I hit enter it quickly showed ..Conduit … Viola! I found the problem. 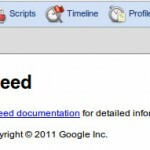 This is the Conduit search which has hijacked the default search engine. I knew conduit from the past as it was installed as part of some Firefox Add-on. Next step is to get rid of this nasty Conduit search from Firefox. 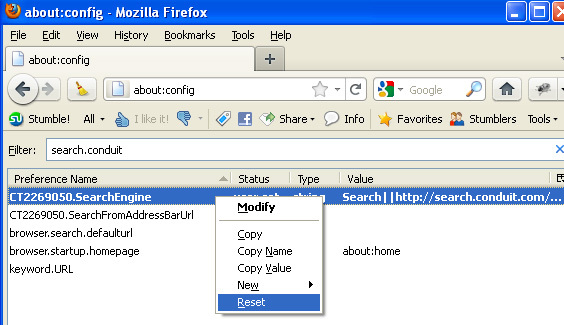 I did more research to find out how to remove Conduit search engine from Firefox browser and found many solution. Instead of wasting time in trying them I opted for the quickest solution which is to reset the Conduit search parameters in Firefox configuration. It will show all the related parameters. Right click on them one by one and reset. 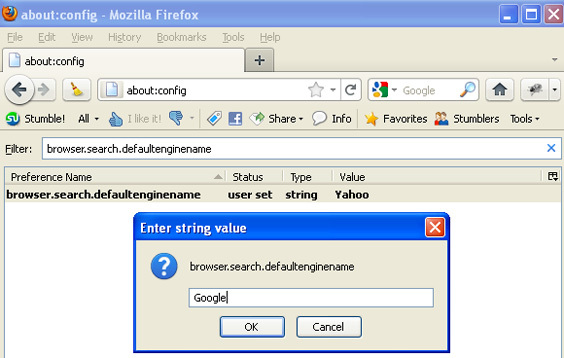 Restart Firefox browser and you type search query in address bar and you will see Conduit is no more randomizing your default search engine. Thanks for this great tutorial. I was highly irritated that I kept getting Bing results when I wanted Google. I had to adjust two files, though — one was the search.conduit file and the other was the keyword.url file — both were set with ‘conduit’ verbiage/urls. I really appreciate you to find a such great solution for the search engine problem. OMG!!!! You just helped me exorcise conduit! Thank you thank you thank you thank you thank you! you have NO idea how much this has been driving me, and now the last trace of the blasted thing is finally gone. I have spent a maddening amount of hours trying to resolve this. I cannot thank you enough. May you be blessed coming and going. I thought I was going to lose my mind!! Dude it’s not working in Aurora…. thank you. Owe ya one. I looked up (Even copied and pasted search.conduit) into the bar and it doesn’t show it yet I am still being redirected to yahoo every time. Good Job Ajay . Conduit is one hell of an irritating extension coz it hijacked my firefox and made life all the more difficult for a Google Worm like me. Thanks a lot for the help.